As NewsBusters has been reporting since the ClimateGate scandal first broke last Friday, America's media have either been shamefully ignoring the sensitive information hacked from a British university's computer system or dishonestly telling the public there's nothing to it. If these revelations furthered the global warming myth by implicating skeptical scientists in a conspiracy to adjust temperature data while shutting out opinions contrary to their own, press outlets would likely have their science divisions poring over every e-mail and document available to find the proverbial smoking gun. Because in this instance any such research could uncover information contrary to the agenda of most news outlets, scientific editors and reporters have abdicated their investigative responsibilities in an obvious attempt to protect policies they support and advocate. One can only imagine the angst suffered daily by the co-conspirators, who knew full well that the “Documents” sub-folder of the CRU FOI2009 file contained more than enough probative program source code to unmask CRU’s phantom methodology. In fact, there are hundreds of IDL and FORTRAN source files buried in dozens of subordinate sub-folders. And many do properly analyze and chart maximum latewood density (MXD), the growth parameter commonly utilized by CRU scientists as a temperature proxy, from raw or legitimately normalized data. Ah, but many do so much more. Skimming through the often spaghetti-like code, the number of programs which subject the data to a mixed-bag of transformative and filtering routines is simply staggering. Granted, many of these “alterations” run from benign smoothing algorithms (e.g. omitting rogue outliers) to moderate infilling mechanisms (e.g. estimating missing station data from that of those closely surrounding). But many others fall into the precarious range between highly questionable (removing MXD data which demonstrate poor correlations with local temperature) to downright fraudulent (replacing MXD data entirely with measured data to reverse a disorderly trend-line). Clamoring alarmists can and will spin this until they're dizzy. The ever-clueless mainstream media can and will ignore this until it's forced upon them as front-page news, and then most will join the alarmists on the denial merry-go-round. But here's what's undeniable: If a divergence exists between measured temperatures and those derived from dendrochronological data after (circa) 1960 then discarding only the post-1960 figures is disingenuous to say the least. The very existence of a divergence betrays a potential serious flaw in the process by which temperatures are reconstructed from tree-ring density. If it's bogus beyond a set threshold, then any honest men of science would instinctively question its integrity prior to that boundary. And only the lowliest would apply a hack in order to produce a desired result. And to do so without declaring as such in a footnote on every chart in every report in every study in every book in every classroom on every website that such a corrupt process is relied upon is not just a crime against science, it's a crime against mankind. Indeed, miners of the CRU folder have unearthed dozens of email threads and supporting documents revealing much to loathe about this cadre of hucksters and their vile intentions. This veritable goldmine has given us tales ranging from evidence destruction to spitting on the Freedom of Information Act on both sides of the Atlantic. But the now irrefutable evidence that alarmists have indeed been cooking the data for at least a decade may just be the most important strike in human history. Indeed, but this raises another question: where are America's science editors and reporters concerning this matter? If a software designer, consultant, and business owner in his spare time can uncover this, why can't America's leading science periodicals or key "journalists" in this debate? Is investigative journalism truly dead in this country, or is it only employed to uncover truths that either buttress the media's view of the world or undermine those that don't? Ignore important facts about a President's "czars"
In the case of the latter two issues, conservative bloggers, talk show hosts, and Fox News were alone in coverage until the mainstream media eventually came aboard kicking and screaming. 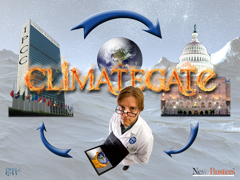 Now, revelations about some of the country's leading climate scientists and activists -- who have ties to the United Nations' Intergovernmental Panel on Climate Change as well as the ear of the White House and leading members of Congress -- are going largely ignored or soft-soaped. Such is transpiring weeks before a major international climate meeting in Copenhagen and as legislation that could have almost unimaginable negative consequences on the economy is being seriously considered by Congress. Where does it all end, and when are Americans going to demand their news media stop acting as a propaganda arm for the far-leftwing of this nation? Exit question: Will Sheppard's discovery force the global warming-obsessed press to finally start covering this growing scandal? Readers are advised that Marc and Noel Sheppard are brothers. Image courtesy Bob Keyser.